Geishas are highly trained in a variety of forms of entertainment including dancing, singing, flute, and shamisen (a three-stringed Japanese guitar) performing, and are also widely regarded as masters of hospitality. In order to achieve this level of skill and expertise, The Geishas undergo at least five years of intense training before they are allowed to host guests on their own. This program has a duration of 1 hour. Geishas are one of the most misunderstood pieces of the Japanese cultural puzzle. 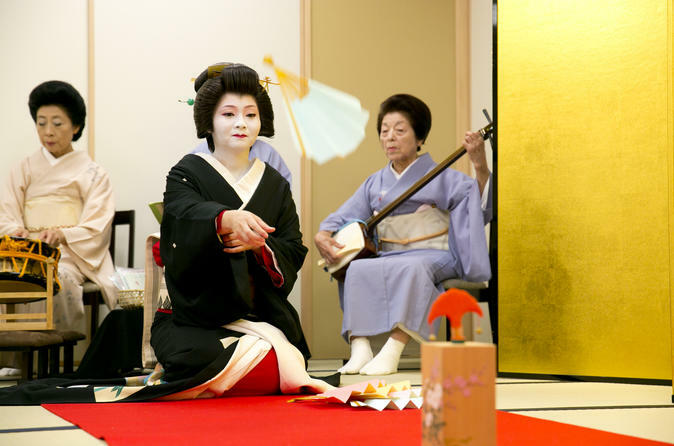 These traditional Japanese entertainers are trained as hostesses with skills in various Japanese arts, particularly dance, music and the tea ceremony. The history of Geishas goes back to the eighteenth century, and even after so much time, modern Geishas still undergo a long apprenticeship process, live in traditional Geisha houses and study traditional Japanese instruments. While Kyoto is considered the most famous Japanese city for Geishas, you’ll find them in several areas of Tokyo as well. Throughout the 60-minute event, the Geisha will perform traditional dances and songs and will converse and play traditional Japanese games with guests. Be mesmerized by the dance and song along with the tune of the Shamisen Japanese guitar to get a glimpse into the world of Geishas. Enjoy playing interactive games passed on for centuries. Makes for a great and memorable activity to enjoy with your family, friends or co-workers. You can also be fitted with a beautiful Kimono gown to make this experience even more memorable.